9 September 1945. 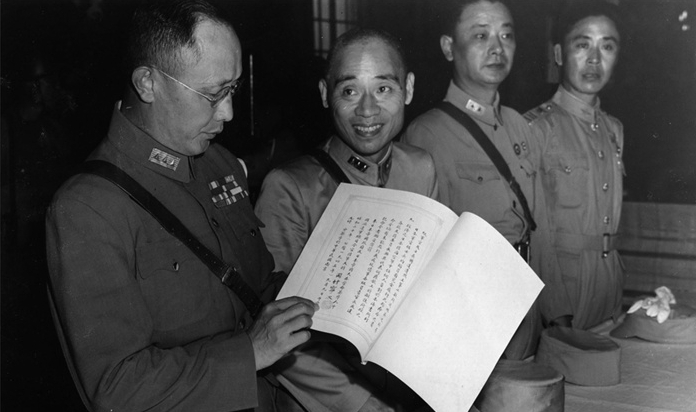 Okamura Yasuji, commander-in-chief of Japan’s China Expeditionary Army, signs and presents the Japanese Instrument of Surrender to General Ho Yin-chin. Ho, on Chiang’s behalf, orders Japanese armies to maintain order, keep control of arms and supplies, take care of POWs and assist KMT forces to retake Japanese-occupied territories in China. 9 September 1945. Free French forces attempt to take Savannakhet, but they are pushed back by the Lao Issara Army with Viet Minh support. Days later, Ho Chi Minh contacts Phetsarath directly to offer fuller Vietnamese support. 9 September 1945. In a formal ceremony at the Government Building in Seoul, General Hodge accepts the surrender of the Governor-General of Korea and Japanese military commanders. Ignorant of the earlier transfer of administrative power in the country, Hodge causes a popular outcry by instructing Japanese officials to remain in their posts for the meantime. The order is swiftly amended but does not recognize the status of the People’s Republic, CPKI or people’s councils; instead, an American military administration is initiated earlier than planned. 9 September 1945. Finally, after a long delay, the main body of Chinese troops enters northern Indochina to disarm the Japanese and maintain order. It also proceeds to plunder the local populace or pay for supplies with Chinese currency at a highly inflated exchange rate. The commander of Chinese forces, General Lu Han, arrives in Hanoi by air on the 14th and establishes himself in the former governor-general’s palace. Ho Chi Minh is swiftly summoned here. However, unlike the British, the Chinese are amenable to an accommodation with the Viet Minh. 9 September 1945. Although they understand the implication of the Sino–Soviet Treaty is that the unification of Outer and Inner Mongolia is not acceptable, the leaders of eastern Inner Mongolia and members of the Inner Mongolian People’s Revolutionary Party do not want to give up hope. They send a letter to Choibalsan, expressing their wishes for unification with the MPR and ask him to pass on their request to Stalin. On the following day, similar letters are sent to the Soviet Army Headquarters.